If you’ve ever visited Niagara Falls, one of the seven wonders of the world, you know the mystique, majesty and power you witnessed there, right? There’s just something stunningly amazing about falling water– it attracts people with its sound and movement. And it’s visually interesting– almost hypnotic. Landscape photographer Roland Kemler once said, “There’s no better place to find yourself than by sitting by a waterfall and listening to its music.” Waterfalls enhance our human experience. 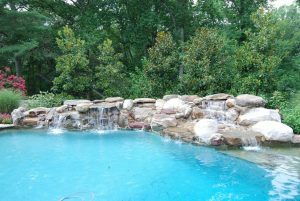 What are some reasons to add a waterfall to your pool? First, waterfalls improve the overall look and feel of a swimming pool. They’re like frosting on a cake. People see them and get excited because water-in-motion is, by its very nature, enthralling to watch. Furthermore, it adds a nice trickling sound to the pool soundscape. That sound is said to be quite relaxing– no wonder so many spas use waterfalls in their offices. Indeed, relaxing sounds help take away a person’s tension and stress, making them feel more at ease and comfortable. If you want to give your swimming pool an attractive and comforting focal point, add a waterfall. Next, waterfalls help keep pool water clean. Algae– that green slime stuff– loves to grow in stagnant water. But if you’ve got a waterfall that’s literally helping your pool water move around, you’re going to inhibit algae growth. The waterfall water helps the pool water circulate. It aids in pool filtration nicely. Finally, adding a waterfall to your pool gives you the chance to make it look more natural or more hip/contemporary– there are different ways to create waterfalls such that they look like they were always there, in nature, just blending in, or, for the more adventurous, they can look like works of art themselves that literally stand out from everything around them. Arch waterfalls or wall-of-water “water curtain” waterfalls are two types of waterfalls to choose from– consult with VistaPro to figure out exactly what you want for your pool. VistaPro can design and build any type of landscape waterfalls you need. Located in Annapolis, Maryland, and serving the DC region, VistaPro has already created many beautiful pool waterfalls– see examples here.